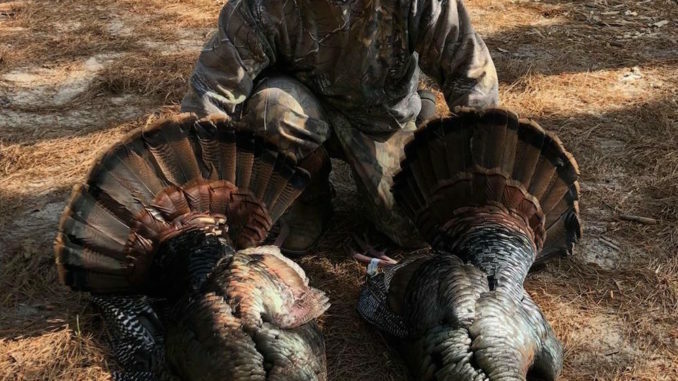 Jay Lanigan killed these two birds in Aiken County during the 2018 South Carolina turkey hunting season. The SCDNR Big Game Program is interested in better understanding the experiences, techniques and factors of success for Wild Turkey hunters in South Carolina. In order to do that we need the input of dedicated turkey hunters. If you hunt turkeys in South Carolina and would like to help out and participate in periodic online surveys please fill out the information below to register. This information helps us learn more about our hunters and make more informed management recommendations and decisions. By signing up, your email address will be included in a list that will receive a survey link that you can access and complete on your computer, tablet or smartphone. The first survey link will be emailed out shortly after the close of turkey season this spring. Other surveys may occur in the future as information is needed.